Frugal Mom and Wife: Free Sesame Street Nursery Bag Tag! 11am CT Everyday! 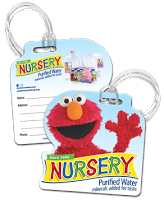 Free Sesame Street Nursery Bag Tag! 11am CT Everyday! Free Sesame Street Nursery Bag Tag! They offer up 100 of these daily and these go fast. You have until the Bag Counter drops to 0 inventory. Their counter is reset everyday so everyone has a chance.